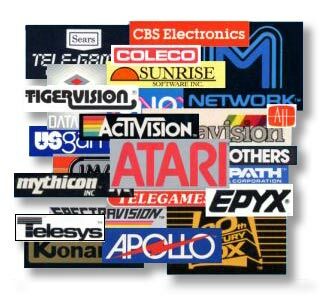 While there are many well-known companies back in the days of the Atari 2600, there are also quite a few small companies that produced software, especially in the waning days of the 2600 (that is, right before the market crashed in 1984!) Unfortunately, many of these small companies were flooding the market with mediocre games, which is one of the things that led to the crash! So nearly all of these companies vanished as quickly as they appeared. Many of the games produced by these companies had limited production and an even more limited shelf life. Larger companies like Atari had many games in the pipeline when the market crashed. Some of these made it to the market in limited quantities while others never made it out even though they seemed complete. A few companies, like Activision and Sega are still around today although they barely resemble their former selves. But the vast majority are long gone. Even Atari only exists as a trademark that gets passed along from one company to another. Clicking on a company name will bring you to a page listing all the games produced by that company for the classic Atari systems. We've also written up a brief history of the company, although these are by no means complete. If you have additional information about a company that you'd like to share, please contact us! Records Found: 161 Click on a column header to sort by that column. Click again to reverse sort order.